When you’re sitting at breakfast giggling over a book and are asked what you are reading, admitting it’s a physics book about unanswered questions will initially earn you some blank looks. I recommend clearing things up by explaining that you were simply surprised, and amused, by the fact that the mass of a llama doesn’t correspond to the mass of all the parts of a llama if you chopped it up into really small pieces – purely a thought experiment, of course. Because this is what We have no idea is all about: big science questions cut into bite-size pieces wrapped in an entertaining tortilla of ridiculous examples and comic-style illustrations. Most of our day-to-day experience and understanding of the world revolves around the 5% of matter the universe contains. What is the other 95%, which includes 27% dark matter and 68% dark energy? To tackle this and other questions science is still unable to answer, Jorge Cham, creator of PHD comics, has teamed up with particle physicist Daniel Whiteson. From the smallest (‘What is the most basic unit of matter?’) to the biggest (‘How big is the universe?’) questions, the authors examine the mysteries surrounding dark matter, new dimensions, the universal speed limit and the big bang. In the process, they delve into what scientists have already discovered and how they continue to push the boundaries of knowledge. My favourite chapters were those on mass, gravity and time – concepts that seemed obvious to me but have reveal themselves to be mind-bendingly complex when examined close up. Cham and Whiteson perfectly balance hilarity and serious science. They can be commended for introducing the reader to such websites as hasthelargehadroncolliderdestroyedtheworldyet.com (check for daily updates) and for the shortest chapter in the book, ‘Can we travel faster than light?’ (Answer: no). Yet, the authors don’t shy away from challenging the reader with complex scientific theories, and don’t always try to make them artificially fun. While the text is light-hearted, peppered with puns and comedy, this never distracts from the matter at hand. Why the book comes as a US and a UK version, I have no idea. The only differences seem to be the colour of the dust jacket and a short foreword; the UK version uses US spelling throughout. 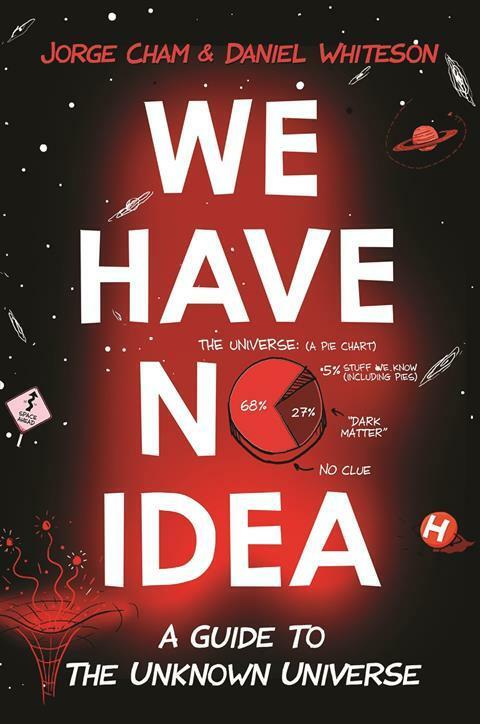 Nevertheless, We have no idea is one of the most enjoyable popular science books I have ever read – I devoured it within a week. The comics nicely break up the text and more often than not got a chuckle out of me. I highly recommend the book to both physics-nourished readers and those who don’t regularly consume science as part of their daily diet.